Today I come back with a line that focuses on hydration and as you know, hydration is one of the most important things for me in terms of skincare and what I'm especially looking for. 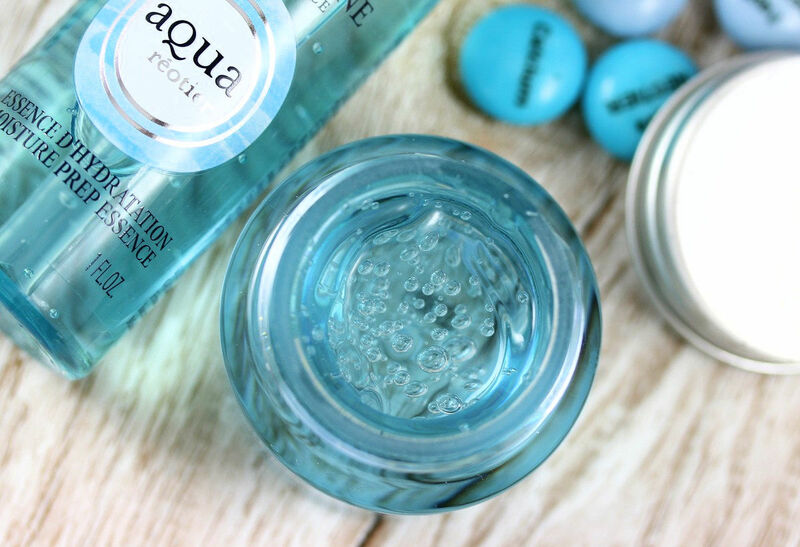 It seems that hydration has become a new marketing trend in the skincare world. Last year for example, Shiseido launched a new line called Waso that also has hydration as the main focus (reviewed here). 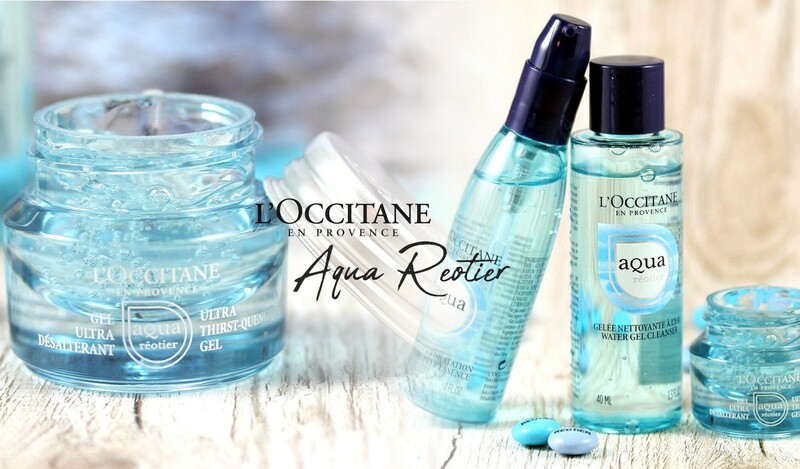 But today it's all about the new Aqua Réotier line from L'Occitane! 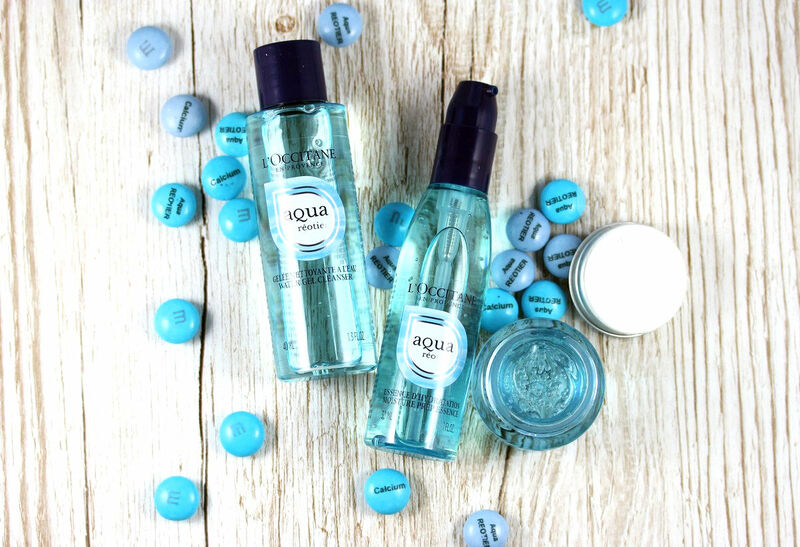 This line is described as a "thirst-quenching, water-based collection, uniquely formulated with 3 powerful ingredients: hyaluronic acid, glycerin, and calcium-rich Réotier spring water derived from the mountains of Provence." 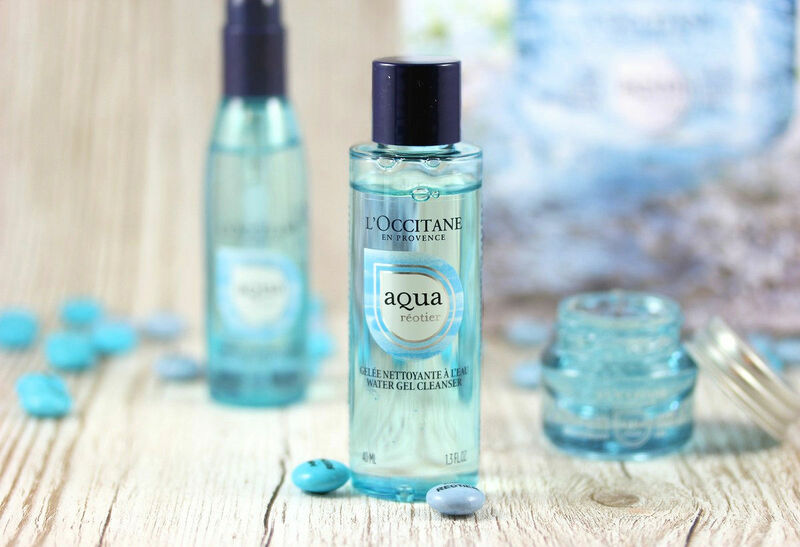 According to l'Occitane, thanks to its high calcium content, the Réotier water helps skin maintain its hydration barrier and retain moisture. 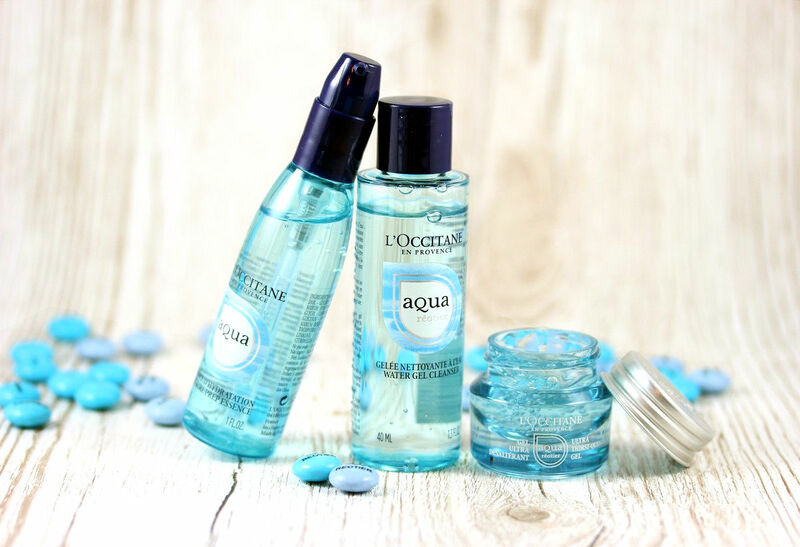 This line consists of a water gel cleanser, an essence, a moisturizing mist, a gel and and cream. I was invited to the launch of the products in Switzerland and received a mini set containing the gel cleanser, the essence and the gel moisturizer. This set can be purchased as a travel set and is also available with the cream instead of the gel. I have below a mini review of the 3 products I've tried. This is a foaming cleanser gel with calcium-rich Réotier water to remove impurities without drying skin. It's actually a gentle cleanser that feels really fresh, it leaves the skin soft and comfortable. It has a pH between 5-6 therefore slightly acidic and perfect to respect the natural pH of the skin. This essence works as a first essence, i.e. the first step of your skincare routine after cleansing. It preps the skin with a preliminary layer of hydration to boost the hydrating properties of the Ultra Thirst-Quenching Gel ort Cream. 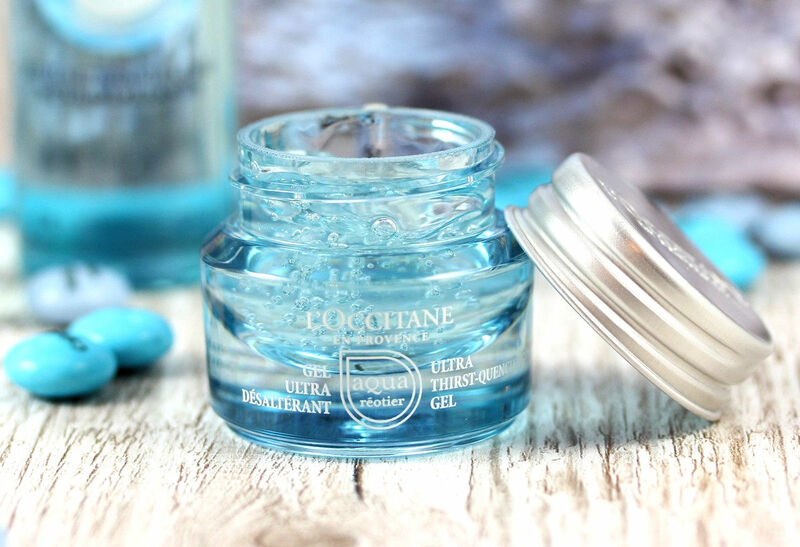 This is a gel-type of essence that turns into a watery texture when you apply it on the skin. It immediately feels hydrating. It is formulated with water from Réotier rich in calcium, glycerin and sodium hyaluronate, 2 humectants that draw water into the skin. This is a true hydration bomb! Overall this is a very nice first step that helps deeply hydrate the skin to prep it for the next steps of your skincare routine. 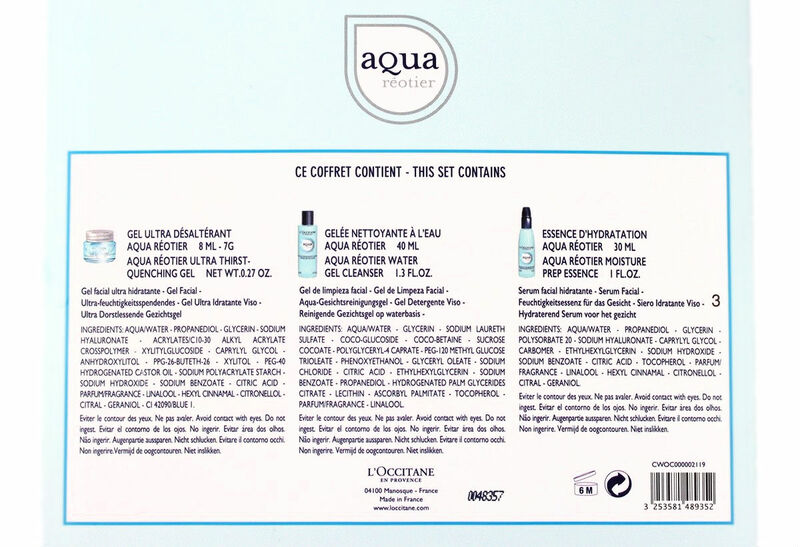 If you know Scinic Iceland Water All In One Ampoule, it's a bit similar in terms of texture and effects. That's typically the type of products I love and that can make a huge difference in a skincare routine. I love using this comparison although it's not totally exact, but imagine a sponge. If it's dry it won't be able to absorb water. You need to wet it before using it, right? With the skin, it's a bit similar, you need to prep it with an hydrating toner or a first essence to make it able to benefit from your next steps better. If you have dehydrated skin and only use a thick cream, it will stay on top of your skin and won't be able to do much. On the contrary if you start with a first essence, like this one, you'll see a huge difference! Therefore this is a product I would recommend for basically everyone, it's also on the gentle side (it does contain fragrance and fragrant compounds such as citronellol and co but I don't think this would be problematic). 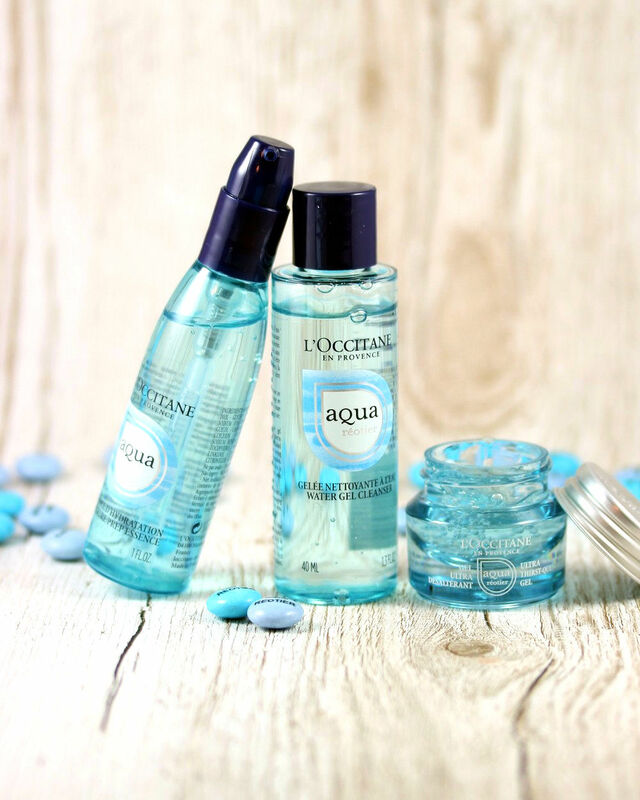 This is a light non-oily gel that is also enriched with Réotier water, glycerin and sodium hyaluronate. The ingredient list is rather on the short side. Other ingredients are mostly texture enhencers and some fragrant compounds at the end of ingredient lists (linalool, citronellol, citral, geraniol). The scent is rather fresh and not strong. This is an ultra fresh gel that is great for oily to normal skin type. It immediately feels really fresh and hydrating, on the other hand it doesn't feel moisturizing. If you have dry skin, it won't be enough as it's really light (the gel cream will be more suited for you in this case). It's absorbed almost immediately but stays slightly sticky. It leaves the skin super soft and silky. For me it's almost too light, I like using it with either a more moisturizing serum or when I use it in the evening, I seal it with a moisturizing sleeping mask, but it remains a product I enjoy using for the hydration boost it brings. 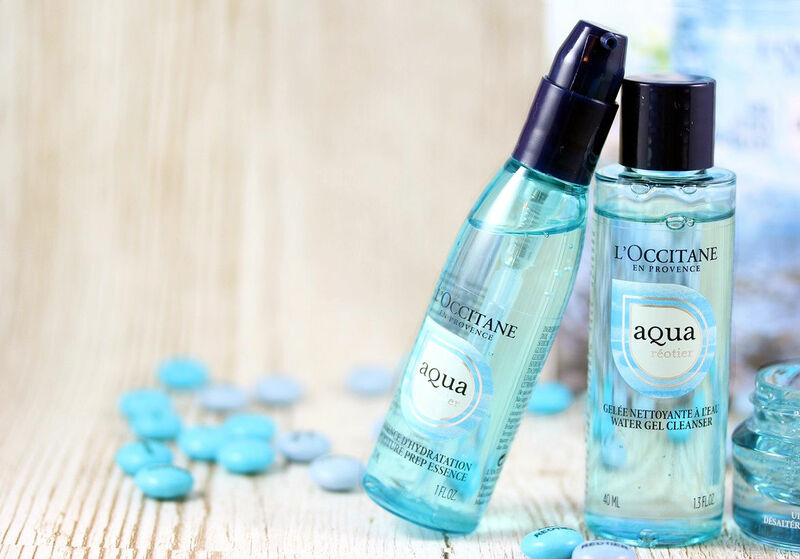 L'Occitane products can be purchase from L'Occitane Swiss website or in L'Occitane boutiques as well as in Manor or some drugstores (e.g., sunstore) or independant pharmacies.